In a move to attract consumers during Earth Day, Ritz Camera, the largest retail camera and photo chain in the United States, have started a partnership (PDF) with Carbonfund.org featuring the Nikon COOLPIX S52. This partnership lets you buy a "special edition ECO-Green colored" Nikon COOLPIX S52 camera and thus become carbon neutral for a month. Basically, each time a customer purchases this special "ECO-Green colored" camera Ritz Camera will make a donation to Carbonfund.org to help offset 1.91 tons of carbon dioxide, per camera sold. According to CarbonFun.org it costs, using their service, $5.50 to offset one ton of carbon dioxide. "We are delighted to offer our customers the 'Buy Green, Be Green' promotion with the new, special edition ECO-Green Nikon S52 camera. We believe our customers will respond enthusiastically to this promotion and together with their support we hope to accomplish our goal of reducing nearly 40,000 tons of carbon dioxide from the environment." 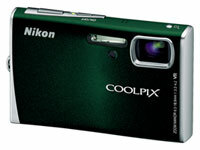 This special edition ECO-Green Nikon COOLPIX S52 will cost you $249.95 and will only be available at Ritz Camera stores in the USA and on www.ritzpix.com/green.